Rajasthan State Pollution Control Board Recruitment 2016: Rajasthan State Pollution Control Board has dispatched employment notification for the vacancies of 35 Junior Scientific Officer and Junior Environmental Engineer posts. Applicants who are interested in these latest Rajasthan govt jobs can check the below given notification. As per Rajasthan State Pollution Control Board Notification 2016, candidates age limit must match with the required age limit mentioned in official notification and relaxation in age for candidates belonging to reservation categories will be applicable as per norms. Applicants who possess the required qualification may apply for this RPCB Recruitment 2016 on or before last date. The online application link for this Rajasthan Environment Dept recruitment will be made available from July 18th. Suitable aspirants has to apply through online mode. Candidates have to visit official portal click on the appropriate and fill the form with your details and click on submit button. After completing the procedure take print of application form and keep it safe for future preference. The RPCB online application form will be closed on 12th August 2016. Providing false information in the application may causes to rejection of candidates application. Selection process will be depend upon written examination and interview conducted by Rajasthan State Pollution Control Board. The written examination for the above posts is going to held on October 16th at various centers across Jaipur. 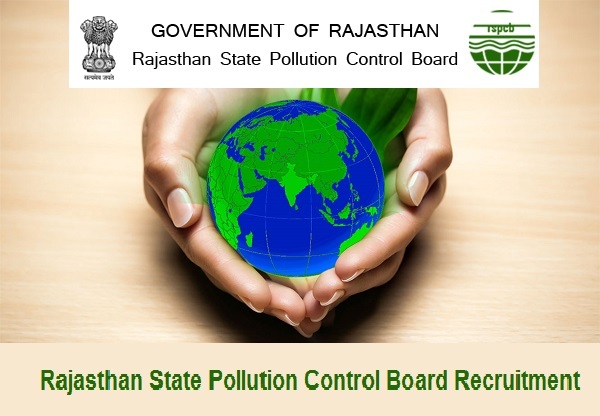 For more information about Rajasthan State Pollution Control Board Recruitment 2016 please refer notification link below. Selection Criteria: Applied candidates need to go through written exam and interview to get selected for their desired post. 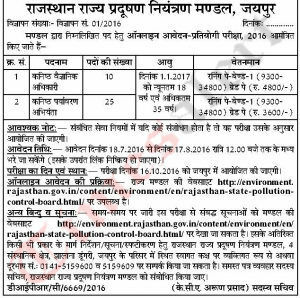 Applicants who are interested in this Rajasthan State Pollution Control Board Recruitment 2016 have to apply by online through official website www.rpcb.nic.in.